OK Folks, Let’s Get Ugly! Sweaters that is! It’s the time of year to celebrate the outrageous, sparkly, twinkly, bold, colorful, too tight, too loose, strange and wonderful apparel of the season! On Thursday, December 13th at 2PM, All American in Londonderry is holding a Festive Fashion Frolic! Our residents want to celebrate the prettiness of the season with the twinkly and the sparkly. The All American Team is in for the outrageous, bold, colorful attire. We begin to walk the Festive Fashion Frolic Runway at 2PM. 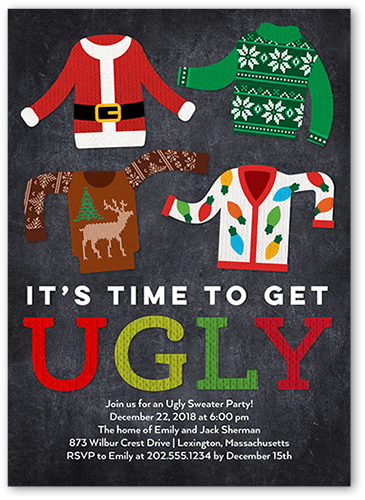 Please join us for some fun in your version of festive fashion! You know there will be a prize dedicated to our healthcare, legal, supportive service, plumbers, electrician colleagues and more that make our world go round and decide to walk that bold runway of Ugliness! Tinsel Tracey and Sugarplum Shannon are waiting to hear if you can join us! Drop us a line via email, send your reindeer over with a message, but don’t be all Bah Humbug! If you join us, we’ll put in a good word with Santa to keep you on the “Nice List”!